What good is a city and state that’s absolutely brimming with great bicycling if you don’t know the best routes or the insider tips? By the end of next year, four new cycling guidebooks — two for Portland, and two for Oregon — will remedy that situation, making great routes and advice available to everyone. 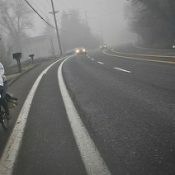 For being such a bike mecca, it’s surprising there isn’t a major guidebook for bicycling in Portland. We’ve got the excellent Rubber to the Road series published by River City Bicycles, but that book focuses on routes outside the city. 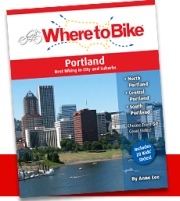 And, thanks to Metro and the City of Portland, we’ve got some of the best bike maps you’ll find anywhere. But those aren’t the same as a nice guidebook in terms of the depth and breadth of detail many people want before exploring new places. Below are brief details on four new cycling guidebooks that will be on bookstore shelves next year. Bicycling Australia (BA Press) started the Where to Bike series in their home country four years ago. They’ve since expanded around the globe and have already published guidebooks for Chicago, Los Angeles, New York City, and so on. The Portland edition is in the works now and will likely be published by spring of next year. 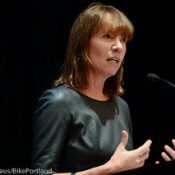 The author is Portland-based Anne Lee, currently the deputy director of the non-profit Community Cycling Center. 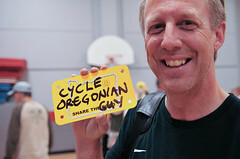 I met Phil Latz, the man behind BA Press and the Where to Bike series when he visited Portland back in April. I was very impressed by his product. The books are packed with useful information, not just about ride details but about the cities they cover as a whole. They also have extensive companion websites. Definitely keep your eyes peeled for this book. Well-known outdoor publisher The Mountaineers has tapped Portlander Owen Wozniak for this new book due out in fall of 2012. Wozniak is the project manager for the Trust for Public Land by day and he’s lived in Portland for 12 years. He says the book will cover the Portland metro area which he defines as Forest Grove to Troutdale and Woodland, WA to Canby. Rides in his book will range from 10 mile urban jaunts to 50 milers in rural areas. In addition to introducing people to new rides, Wozniak says he’ll also emphasize local culture and, “the potential for car-free recreation and living.” To that end, he’s designed as many of the routes as possible around public transit (mostly MAX) access. Ellee Thalheimer is an established guidebook author who recently wrote Lonely Planet’s Cycling in Italy. She’s also co-founder of The Portland Society and a yoga instructor. 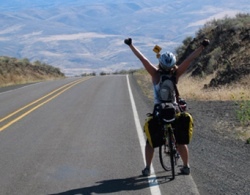 With funding from Cycle Oregon and Travel Oregon she’s currently on tour, researching the best routes in Oregon for a new, self-published book due out next year. 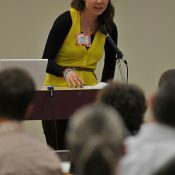 Ellee is keeping a blog about the creation of the book at CycleTouringOregon.com. 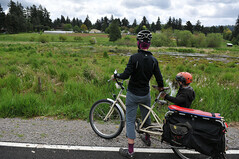 Ellee’s sold on bike touring. “It’s the absolute best way to travel in my opinion.” As for the book, “It’s a love project,” she says, “Oregon will be acknowledged on a national and international scale for its overwhelmingly diverse cyclescapes that will twist your spandies backwards they are so spectacular.” Nicely said. Jim Moore is the copywriting powerhouse behind such projects as the Cycle Oregonian (the “newspaper” that appears each morning during Cycle Oregon), and the stellar Ride Oregon Ride website. His new book is due out next spring and he’ll uncover some great rides in rural Oregon towns like Heppner, Ukiah, Sumpter, Burns, and more. I’m getting inspired to ride just reading this post. I can’t wait to delve into all these books when they hit the shelves! Stay tuned for more information and get ready to explore some great new rides next year. Come to Amity! Oh the Horror! Don’t forget the brand spankin’ new PDX by Bike tip zine — not exactly a classic guidebook, but essential for folks who want to get a feel for riding around our city. 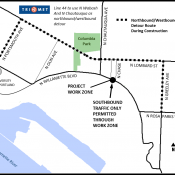 wow, a plethora of recreational cycling info in the offing – good news! As a side note, i just noticed that ODoT has updated the Oregon Coast bike map, and while to old one was quite good this new version is really well designed, and attractive.